Never have I ever made a wishlist sooooo random. I was window shopping away online a couple of days ago and I ended up coming across so many random bits that I'd just love to possess right now. Firstly starting with the Olympus Pen camera. I've been thinking about a new camera for a couple of months now, and not that there's anything wrong with mine. It's just I might need something a little smaller and faster for on the go. The Olympus Pen E-PL7 is also just amazing for everything and I neeeeeed it! I found some other neeeed things too including 'The Story Of My Life' book. Self-explanatory, just fill it in. A candle that's brown sugar scented but has a funny name. And I've wanted a marble phone case for ages but I can't justify right now! 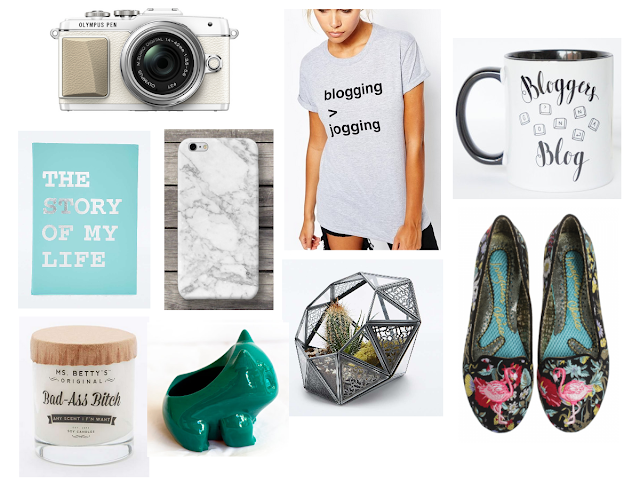 I'm also really liking blog related things like this tee I spotted on Zoella a few weeks ago, and ofc I shall one day need a blogging mug. I still have a terrarium on my wishlist if that cute Bulbasaur Planter doesn't come first, and I'm obsessing over those cute flats from Irregular Choice. Just why so expensive!? It's a truly random wishlist but hey! We all need one right? What's the most random thing on your wishlist right now? Need the T-shirt ever since I saw it on a blogger or something!! Also, loving everything marble atm and need that phone case! Maybe Zoella!? That's who I saw it on! I wanttttt.